We know that having to undergo revision rhinoplasty surgery is both financially constraining and emotionally draining. The important thing is that if you are ready to get your nose fixed, we are here to help you finally achieve the result you always wanted. Whether it is a small tweak or a major revision you seek, our team of Drs Solieman and Litner, two highly-specialized Facial Plastic surgeons will fully analyze your condition, listen to your frustrations and explain what can be realistically achieved with your Revision Rhinoplasty. Revision rhinoplasty can be one of the most life and appearance enhancing procedures that is done. In this case previous rhinoplasty had resulted in not only significant breathing problems but also significant cosmetic concerns including twisted nose, an over projected look and tip bossae and a hanging columella. The result of Revision Rhinoplasty is a natural looking, beautiful nose that seamlessly fits and allows her to breathe normally. (She also had neck liposuction which did an amazing job of improving her neck line). Why Patients Choose us For Revision Rhinoplasty? Two surgeons are better than one. Your Revision Rhinoplasty is an even more intricate, nuanced procedure than your original Rhinoplasty. Oftentimes, the previous surgeon has removed or severely manipulated the underlying nasal cartilage. Having both Drs Solieman and Litner assessing and correcting your functional issues during surgery exponentially increases your chances of a highly satisfying result. 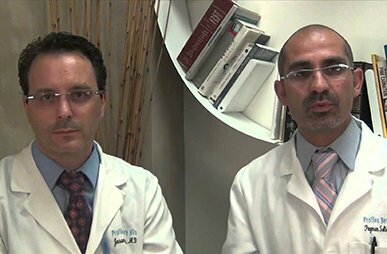 This unique team approach is the reason Profiles Beverly Hills is one of the foremost Rhinoplasty centers in the world. Drs. Solieman and Litner will do their utmost to ensure that your first nose surgery with us is also your last. By working together, Drs Litner and Solieman are able to consistently achieve some of the highest success rates anywhere in the world. Feel free to browse through our Revision Rhinoplasty Photo Gallery. What you will find is that each patient has a result that is unique and appropriate for him or her. Whether you come to Profiles with an overly scooped out bridge, a crooked nose, or a deformed nasal tip, our surgeons will have the answer for you. Our commitment to you begins with your first visit but that’s not where it ends. Drs Litner and Solieman follow up with you for years after your procedure to ensure that you not only get the nose you have always wanted but that it stays that way. We operate on patients who fly to us from other states and countries with every problem you can imagine and we work with each of them to accomplish the beautiful, natural look that is right for them. I had a revision rhinoplasty and am truly happy with my results! My nose was crooked, had breathing problems, asymetrical nostrils(the list goes on).... it was terrible! I was so scared that they wouldn't be able to fix it.... but, Dr.'s Litner and Solieman were able to make me look normal again. They did such an amazing job.. very natural results. I had a revision done on my nose. It was twisting and the cartliage was collapsing inside so I had some caving in of the side nose walls. 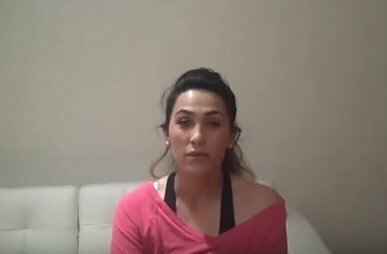 I was scared and very nervous that they would change my appearance drastically or that their nice and sincere attitude would stop as soon as I paid for the procedure. This wasn't the case at all, they were the most sincere and nicest doctors. I love the job they did. A scooped out profile is probably one of the most common problems we see after rhinoplasty. It usually occurs after routine reduction rhinoplasty when there was a bump on the bridge that was shaved down too much. This is particularly problematic when this occurs in men, as it is a feminizing feature. Right is a diagram of a nasal hump reduction. This can happen for a few reasons. Many rhinoplasty surgeons still prefer to make a bony bump smaller using a chisel or osteotome shown below on the left. We prefer nasal rasps, which are essentially fine files, shown below on the right. Osteotomes are sharp instruments that cut through the bone at a desired level to lower the hump. This is an all-or-nothing thing where the bump is removed in one shot. The problem is one of judgment and execution. Sometimes the angle isn’t right or the surgeon thinks he or she is taking down the bone to a certain level only to find out that he or she misjudged. 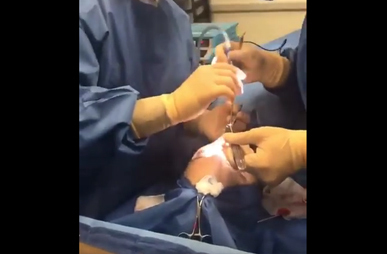 It can be even easier to make this mistake using a closed rhinoplasty approach (from inside the nostril) where this maneuver is being done under the cover of the nasal skin. In this case, you can’t exactly see what you’re doing, so most of the work is done by ‘feel’. It takes a lot of experience to develop that ‘touch’ and to consistently get it right. We prefer to use rasps to reduce a bump. These instruments can be used to slowly whittle or file down the bony bump. That way we can accomplish this three-dimensionally in a very careful and controlled way. When the bone is reduced too much, the nasal profile will look scooped and the bridge will look washed out and child-like from the front view. To fix this, we need to build the bony bridge back up again, most often with your own cartilage. See the photos below to show the area of bone that was over-reduced, and what the bony profile should look like. The green shaded area is the area of the bridge to be built up. So, what is a pollybeak deformity? Well, that’s the unpleasant and unkind name we give to a nose in which the area just above the tip is too full. Normally, there should be a little dip or depression just above your nasal tip that defines the transition from your bridge to your tip on profile. In a woman, that little dip is a feminizing feature. When that area is too high or filled in, we call it a pollybeak. When it is very full, it can even make the nose look down-turned like a parrot’s beak, thus the name. The reason for this is that the area above the tip often becomes the part of your nose that sticks out or projects the most from your face. This is not the way it should be. Your tip should be the most projecting point of your nose. Check out the photo below to see a pollybeak deformity indicated by the arrows. OK, what causes a pollybeak deformity? Well, a few things can and they are all preventable. First, a surgeon may not reduce the cartilage enough in the area above your tip. Second, the surgeon may be overaggressive in reducing that area too much in someone with thick skin. In this case, the skin doesn’t contract and flatten out as much as it should and, instead, the area fills in with thick scar tissue. Finally, a surgeon may not provide enough support to your nasal tip. Over time, your tip may droop and make the area above the tip look too full. Look here to see the plan for fixing this pollybeak deformity. The green area is the area of the bridge that was built up in the last blog post. The blue shaded area shows the cartilage that has to be shaved down to correct this appearance. Notice how the tip itself also has to be deprojected or brought in closer to the face. If only the pollybeak was taken down but the tip was not brought in, it would look too high and too pointy. This is not a good look but it is something we also see a lot after first-time rhinoplasty because tip correction is harder to do. On the right, you can see how much more balanced the tip looks now. This is by no means a final image. Even the picture on the right doesn’t look quite right yet because we haven’t addressed the other problems with this nasal tip. It still looks pulled down and rounded and the nostrils have to be addressed. Tune in to our next post to see us pull together the final imaged picture. In the previous two rhinoplasty mistakes described above, we have taken care of imaging for a poor rhinoplasty result to address problems with the nasal bridge. Now it’s time to take a look at the tip. A frequent problem after an overaggressive rhinoplasty is a tip that becomes distorted and lacking in support. This usually happens when too much of the tip cartilages are removed in trying to narrow and refine the tip. Instead, you just end up with a tip that is unstable. We have lumped these 3 rhinoplasty surgery problems together because they often occur together after a Rhinoplasty in which the tip cartilages collapsed. The rhinoplasty diagram to the left shows the area of the tip cartilages (in red) that is commonly removed during a Rhinoplasty. This would be considered a reasonable amount in most rhinoplasty patients depending on their skin thickness. The key of course is not to remove too much. Many rhinoplasty surgeons are very aggressive with these maneuvers and may take out most of this cartilage or slice right through it without repairing the edges. They do this because the short-term changes can be very dramatic. You can turn a wide boxy tip into a very narrow one. But, the long-term results are usually devastating as the tip becomes progressively pinched and distorted over years. If too much cartilage is removed in this area, the tip can start to collapse. It can often look asymmetrical with formation of bossae or little deformities and bumps in the cartilage that show through the skin. Also, the tip can start to rotate up too much. This gives the nose an upturned and shortened “Ms. Piggy” appearance that is positively despised by everyone who is unfortunate enough to inherit this problem. This problem can be exaggerated when surgeons also remove the nasal spine (the bone at the bottom of the tip) and the bottom part of the septum. To figure out which part of your nose we’re talking about, you can feel around just inside your nostrils. First, look around and make sure no one is looking. Now, if you pinch the skin between your nostrils and advance your finger and thumb back a bit, you will feel a firm but wiggly piece of cartilage that is the bottom part of the septum. Are your eyes watering yet? Maintaining the integrity of this anatomy is critical to ensuring a good, strong result over time. If the above mistakes are made, the columella or structure separating the nostrils can appear to hang down too much, called a hanging columella. Also, the rim of the nostrils can appear pulled back or retracted. Ideally, the distance between the edge of the nostril and the bottom edge of the columella should be no more than a few millimeters. Anything more creates a very unflattering look that resembles a snarl. What’s worse is that breathing can also be affected. These problems can be fixed but it can take a lot of effort including complex cartilage grafting. Take a look at the imaged photos below to see the final step in improving the appearance of this nose with revision rhinoplasty surgery. The green shaded areas on the imaged photo are areas to be augmented or built up. The blue shaded areas are areas to be shaved down. You can see that the columella is pulled up, the nostril rim is pulled down, and the angle between the tip and the upper lip is better. Notice that the tip still projects outward by almost the same amount, but it looks so much less dominant and heavy when these problems are corrected. The rhinoplasty photos below show the original before revision rhinoplasty photo on the left, the imaged result in the middle, and the patient’s actual post-operative after photo on the right. We make the imaged photo imperfect on purpose so that we don’t over-sell the possible results. But, you can at least get an idea of what needs to be done to bring this profile back into a balanced and harmonious state. We can’t make the surgical result match the imaged result perfectly but we can get pretty darned close. And we hope you’ll agree that we were able to accomplish our goals. There is still a little swelling in the 3-month after photo at this stage and we expect it to settle over the next few months. 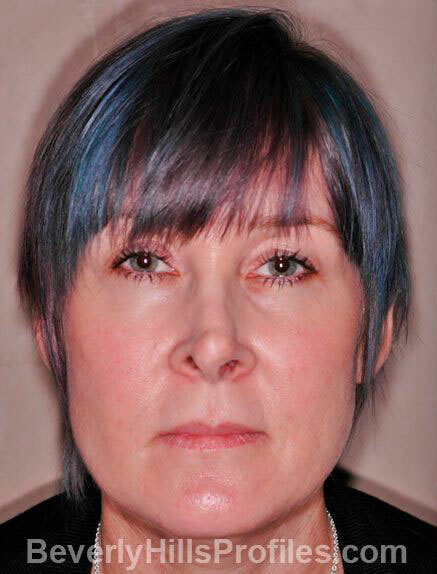 The patient was ecstatic with the result and thinks her new nose looks even better than the imaged version. And that couldn’t make us any happier! An extremely frequent mistake seen after primary Rhinoplasty surgery is a persistently over-projected tip. This means that the nasal tip still appears to stick out too far from your face. There’s a reason that this mistake is so common. The first reason is that many rhinoplasty surgery patients are initially more concerned about their bump than anything else and are happy if the bump is all that is removed. Many patients afterwards, however, realize that the tip still appears too prominent and then they’re not so happy anymore. The second reason is that technical maneuvers to reduce the nasal tip’s projection are more sophisticated. Many Rhinoplasty surgeons were never trained in these maneuvers and simply don’t do them. Many have tried them but have experienced problems and now choose to avoid deprojecting the tip. Lastly, it is almost impossible to achieve meaningful deprojection of the tip through a standard closed Rhinoplasty approach in a way that still provides enough support. So, you get what we see in the photos below. Below is an example of one of our revision rhinoplasty surgery patients who was unhappy with her tip projection among other things. You can see that her tip looks too prominent. Her bridge is a little too sloped as well from her previous Rhinoplasty which makes her tip look even more pointy. Her Profiles Beverly Hills Revision Rhinoplasty included some augmentation of the bridge with tip deprojection, effectively restoring a more natural, attractive balance to the profile. And, even better, because of the way we perform this procedure, her nose will stay stronger than if she had never had anything done. Think of the tip cartilages like a pair of wings. You can get an idea of what these look like from the rhinoplasty photos below. The cartilages are like a bent spring that holds the nostril’s shape and keeps it open to allow normal breathing. In many poorly done rhinoplasty surgeries, this cartilage is aggressively cut or removed so that it loses this natural spring. Over time, whatever cartilage is left starts to bend and twist under the weight of the skin. As the cartilage twists on itself, the weak points at the ‘joints’ of this cartilage can start to form bumps or knuckles, called bossae, that are very noticeable through the skin. Check out the diagram below to see what we mean. Many rhinoplasty surgeons treat these bossae by going back and trimming them, weakening the cartilage even more. Anyone can appreciate that this is probably not a good long-term solution. 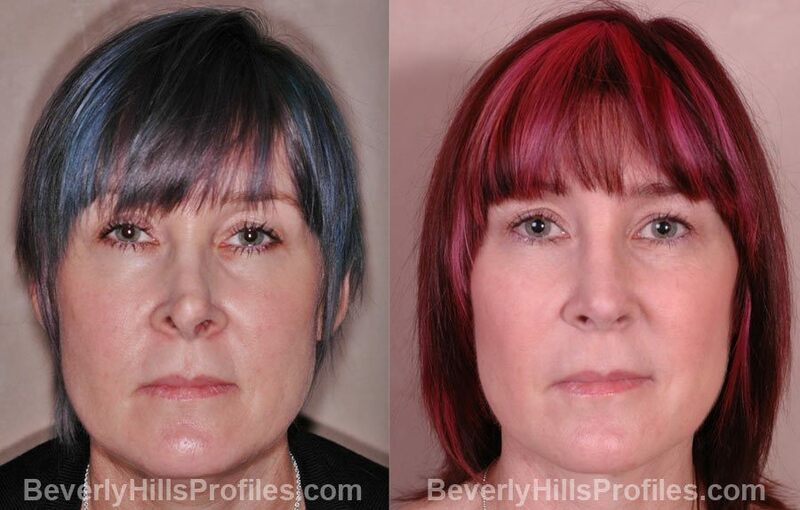 The Beverly Hills Revision Rhinoplasty Before and After Photos: Nasal tipsurgery experts at Profiles know that the tip cartilages must be reconstructed in order to restore their natural strength and resiliency while improving on the cosmetic appearance of the tip. The revision rhinoplasty surgery photos to the right show the above Revision Rhinoplasty patient treated at Profiles to take care of her tip bossae and other post-rhinoplasty concerns highlighted in the next few sections. There really are two types of nasal valve collapse. The collapse of the tip cartilages described above can cause external valve collapse where the blockage is just past the nostril. When most rhinoplasty surgeons discuss valve collapse, though, they are talking about internal valve collapse. This occurs when the upper lateral cartilages in the Before and After Photos: Nasal Valve Collapsemiddle of the nose have been too narrowed. Check out the attached diagram to see where these are. This problem happens when a nasal bump is taken down too much and when the cartilages themselves are shortened or not reattached during a Rhinoplasty. The problem seems to occur more often after a closed Rhinoplasty because most surgeons detach these cartilages without repairing and reattaching them at the end of the procedure. When the natural cartilage supports have been lost, they simply fall inwards and collapse. The result is poor breathing and two visible cosmetic deformities. One is called an ‘inverted V deformity’. That’s because the collapsed area where these cartilages attach to the nasal bones looks like an upside-down letter V. Check out the photos below to see an ‘inverted V deformity’. The second problem is that the middle part of the bridge can start to look very pinched. This is a common problem after Rhinoplasty and the revision Rhinoplasty experts at Profiles Beverly Hills fix it using extended spreader grafts among other techniques. Click here to see our blog on the use of spreader grafts. In the last section, we took care of this patient’s tip abnormalities. Below we turn our attention to the upper two thirds of the nose to correct her remaining problems. The nasal bones are not so much like a pyramid but more like an arched covered bridge or tunnel. When a bump is made smaller, the top of the bones are shaved or cut shorter to reduce the bump. This leaves an opening in the roof of the bridge. That’s one of the reasons why we have to cut the base of the bones during rhinoplasty surgery (called osteotomies). We perform osteotomies in order to push the bones inward towards each other so that this opening can be closed. If the opening is not closed properly, we call the resulting problem an ‘open roof’ deformity. 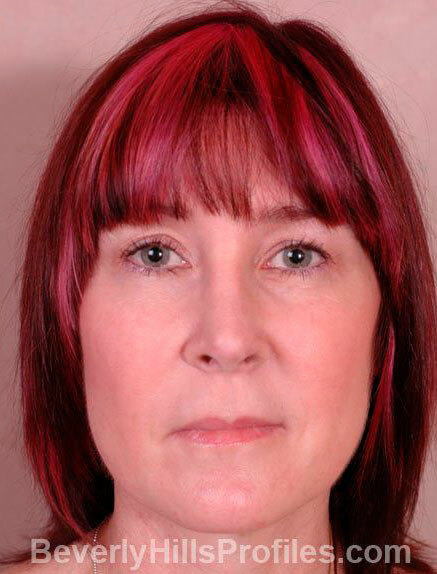 The photos to the left give you a sense of what this rhinoplasty problem looks like. When you have an open roof, the middle part of the bridge will look and feel unnaturally flat. The edges of the bones are separated and can be seen and felt as a prominent bump at the side edge of the bridge. Los Angeles and Beverly Hills Rhinoplasty and Revision Rhinoplasty Surgeons Dr. Solieman and Dr. Litner have extensive experience correcting these and many other Rhinoplasty deformities. To repair an ‘open roof’ deformity, the bones need to be brought back together again. Sometimes, the bones have been so shortened and whittled away that it is impossible to bring them together without pinching the top of the nose completely. In this situation, it is necessary to rebuild the roof with grafts. Whatever the extent of your Rhinoplasty concerns, the Profiles surgeons are well-versed at tailoring your procedure to address your individual issues. The final rhinoplasty surgery mistake and problem we will talk about is the twisted nose. A twist in the nose can happen anywhere from the nasal bones to the middle third of the nose and down to the tip. Getting a nose completely and perfectly straight is one of the hardest things to do in Rhinoplasty and is especially hard in revision Rhinoplasty. That’s why you need to see a very experienced Rhinoplasty specialist like the Los Angeles Rhinoplasty surgeons at Beverly Hills Profiles. A frequent cause for a twisted nose is crooked nasal bones. This can result when a pre-existing crooked bridge simply was not corrected appropriately or when poorly performed osteotomies caused the bones to shift. Osteotomies, as mentioned above, are one of the most underrated parts of this complicated procedure by inexperienced surgeons who get caught with some of these post-rhinoplasty problems. Very careful planning and execution of each and every maneuver can go a long way to preventing these problems. If the cartilage of the mid-nose or tip is twisted, sometimes it can be corrected by re-suspending or stabilizing the cartilage with sutures. This includes repairing the normal connections between anatomical parts that have often been lost with prior surgery. More often than not, we find during revision Rhinoplasty that many of these normal structures have been damaged or removed, causing the lower part of the nose to buckle and warp. Sadly, this is often beyond simple repair. In these cases, grafts of cartilage taken from your septum (if available), your ear, or rarely your rib, are needed to rebuild the lost tissues and reconfigure their normal connections and supports. So there you have it. We have illustrated a handful of the most common rhinoplasty mistakes and how we can fix them. There are a lot of sticky details that go into this, and cases such as these can take us many hours to perform. But, we take as much time as we need to get it just right because our overarching goal is that your first Rhinoplasty with us should also be your last!